Margaritaville Hollywood Beach Resort, wished to enhance their strong brand identity and were on a quest for the perfect uniform which would reflect their values and mission statement. Wanting to expand their business and reach a larger audience, Margaritaville Hollywood Beach Resort felt their property needed a uniform program that complimented their strong cohesive brand identity and the company desired to create a memorable experience for their guest. They wanted to clearly communicate the values and mission of their property and increase their customer base. Appreciating the power that each employee has to express their brand, they desired to create representative clothing which would be seen by every employee and customer and impart all that was unique about their brand. 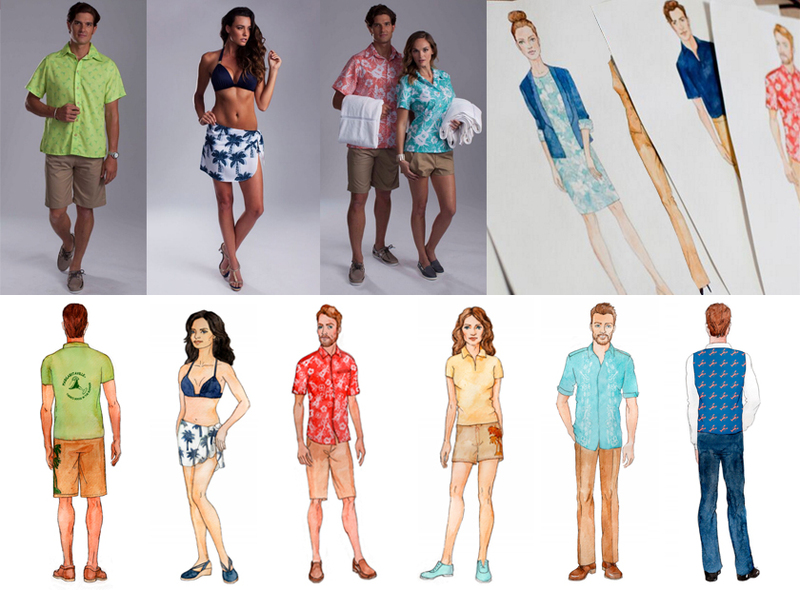 Initially, EM Design examined and analyzed every aspect of the Margaritville unique brand to arrive at a brand interpretation that was represented in the power of the color, texture and custom designs of textiles. From this foundation, specific styles were created which aspired to inspire the essence of the brand in both the employees who wear the apparel and the observer. Utilizing over 20 years of experience EM Design took the vision and incorporated practical aspects of real life function such as the desired longevity, range of end users, and climate variable. After all partners had agreed upon the desired end product, EM Design went to work utilizing their extensive data base to locate fabrics that fulfilled the desired price point, durability and delivery date. The end product was everything Margaritaville Hollywood Beach Resort desired. Employees were inspired by the beautiful creations they were to wear daily which boosted enthusiasm for the brand. This enthusiasm organically spread to the customers with whom they interacted. The results were everything they desired.